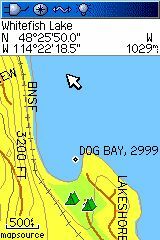 The purpose of this project is to create electronic topo maps for the state of Montana for Garmin GPS units with mapping capability. This is an on-going project with additional updates performed as time and resources allow. 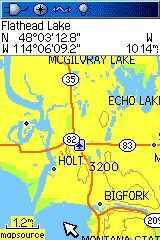 The mapset covers the state of Montana. For use from within Garmin's MapSource (on PCs), download and execute the mapset installer below. This program will install the map files and register the mapset with MapSource. 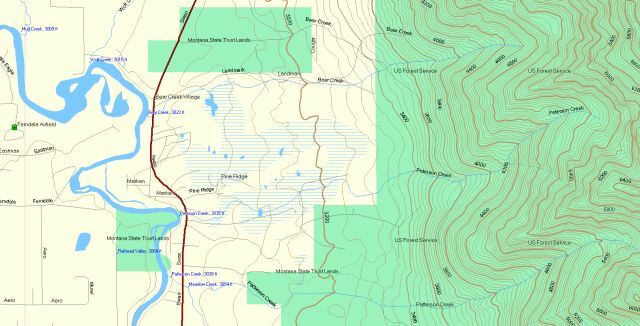 Within MapSource a new mapset product "Montana Topo Maps" will be available in the Product drop down selection list (or from the View | Switch to Product menu option). 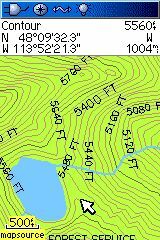 The Montana Topo Maps mapset should overlay any other mapset present on your GPS unit. To switch between mapsets (if more than one has been loaded to your GPS) simply hide/show mapsets as described here. Special thanks to Matt B. and Tom S. Matt collected the vast majority of data, performed a lot of preprocessing and continues to provide testing and feedback. Tom helped with the processing of NHD data. Their help enabled this mapset to be created very quickly and with a nice set of data layers. NRIS actively supports GIS coordination in the state of Montana and works hard to provide products and services to a diverse community of users. NRIS also contributes data to national efforts such as GeoSpatial One Stop and the National Map.